Not sure what to get your favorite FIAT Friend? 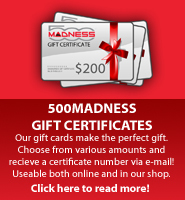 Get them a 500 MADNESS Gift Certificate and let them choose! This listing allows you to select a gift certificate in the dollar nomination that is right for you. 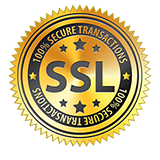 Once you select the dollar amount of the certificate please follow through to the check out. When you complete the check out process and pay for the certificate you will receive a confirmation email and a Gift Certificate Code will be emailed to you. You can either use the Gift Certificate Code yourself at any time or forwarded it to the person who you wish to give the Gift Certificate to. He/She will be able to select the item(s) they want to purchase and check out through our site. When they go to the check out page to pay they will enter the Gift Certificate Code and the dollar amount of the Gift Certificate will be subtracted from the total due. If you have any questions at all please do not hesitate to call us at 562-981-6800. We will be glad to answer any questions you may have.